Each weekday, 65,000 SEPTA Regional Rail passengers ride in cars dating to the 1970s, on tracks that are 100 years old. 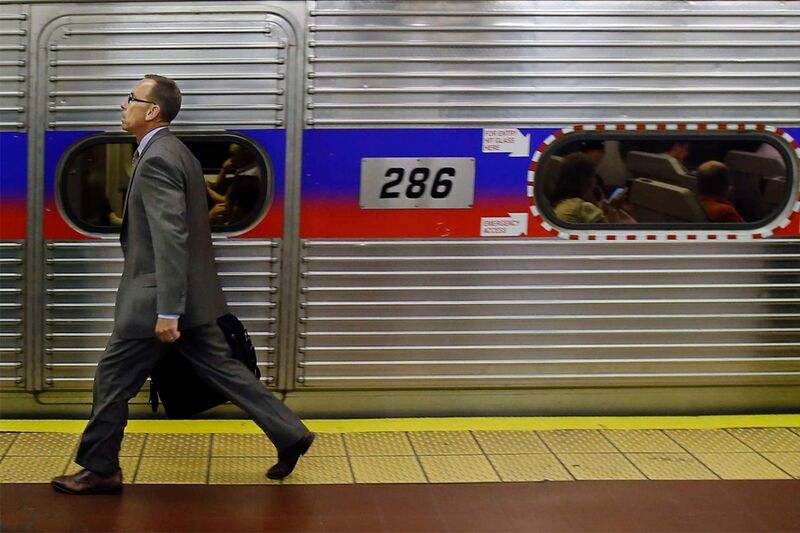 This is no way to run a railroad: SEPTA dispatchers "flying blind," or losing track of trains because of poor communication with Amtrak, and riders not knowing when their train will show up because of chronic lateness and unreliable status reports. Each weekday, 65,000 Regional Rail passengers ride in cars dating to the 1970s, on tracks that are 100 years old. No wonder more than 40,000 trains (17 percent) were late across the network's 13 lines last year - or that nearly 1,300 trains were canceled. An Inquirer analysis found that SEPTA fails to meet riders' and its own expectations, and is plagued by outdated equipment, lack of funding and personnel, growing ridership, and a complicated relationship with Amtrak. The agency has failed to consistently meet its 90 percent on-time goal for three years. In the first six months of this year, trains had an on-time rate of 85 percent. And that was before one-third of the fleet was pulled from service last month because of dangerous structural flaws. Since then, on-time performance has dropped below 70 percent, reports Randal S. Olson, a data scientist at the University of Pennsylvania. SEPTA's assurances that safety and performance are top priorities are tough to swallow. Requiring stranded riders on the Paoli/Thorndale line this month to scramble through a ditch and climb a highway divider to reach a road two miles from the next station hardly seems safe or customer friendly. True, the 120 defective Silverliner V cars were shelved before anyone was hurt, but they should never have been bought from the inexperienced manufacturer, Hyundai Rotem. Adding insult to injury, SEPTA is holding off on buying 45 desperately needed double-decker cars while it resolves the Silverliner V defects with the South Korean carmaker - one of the bidders for the pending $190 million contract. Repeating the agency's mistake with Hyundai Rotem would be a slap in the face to the riders who have stoically and graciously dealt with this summer's curtailed schedules and delayed and cramped trains. On a broader scale, the system suffers from a frustrating lack of communication and a maddening failure to maintain and upgrade service. Arrival times listed on electronic signs, crackling from speakers, and posted on SEPTA's app are often wrong. Worse is being kept in the dark when trains run abnormally late or break down. Riders can be trapped for an hour or more without knowing how and when they'll reach their destinations and how to adjust their plans. Conductors often know less than the Twitter-following passengers or fail to announce details. Management knows the system's problems but needs to speed up the fixes. Two-dozen engineers finally have been hired and are being trained. Thirteen electric locomotives won't arrive until 2018. A smart-card fare program is inching forward after a three-year delay. Yet, for fear of glitches, system-wide fare increases were postponed a year. SEPTA has too many projects on its to-do list to wait for that revenue. Like its trains, the agency is running way behind in giving riders the safe, reliable, and comfortable service they pay for and deserve.